I have found a new favorite national park! …Well, at least for now. 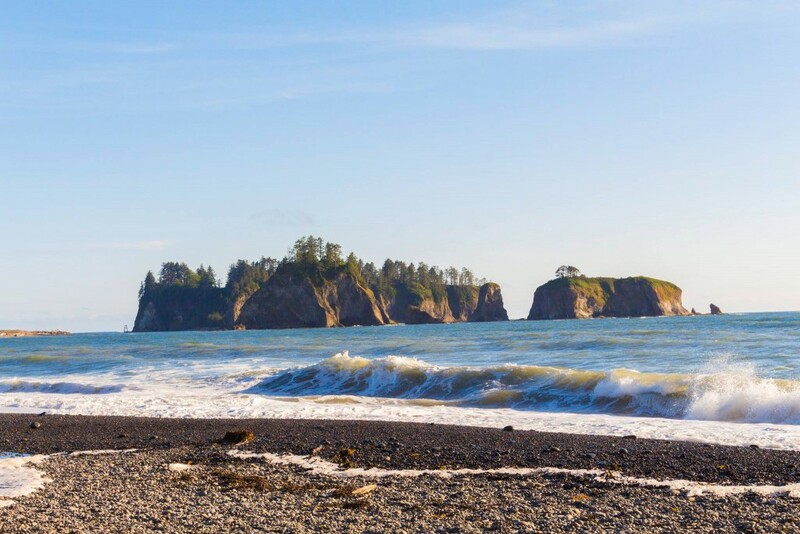 This park has it all: coast, forests, and mountains. 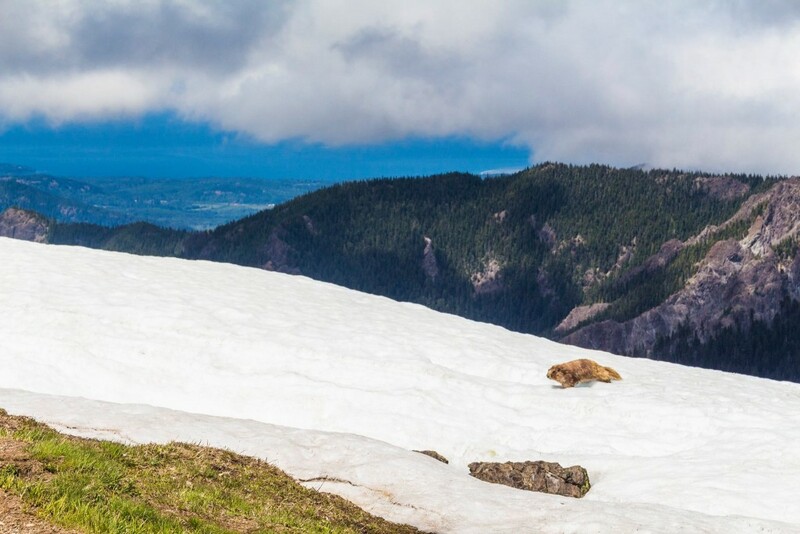 Recognized as a World Heritage site for its rich resources, it was designated as a National Park in 1938. 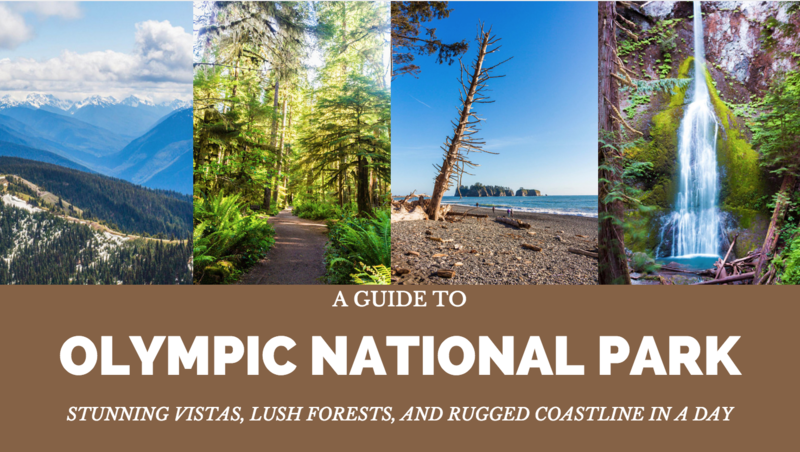 Did you know that Olympic National Park protects the largest old-growth forest in the Pacific Northwest? 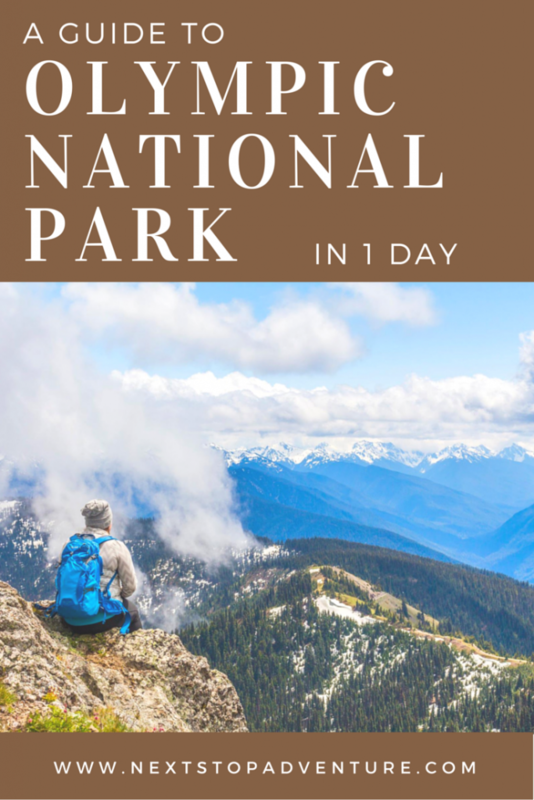 We had 1 day in the park, but you could spend several days exploring this special park. 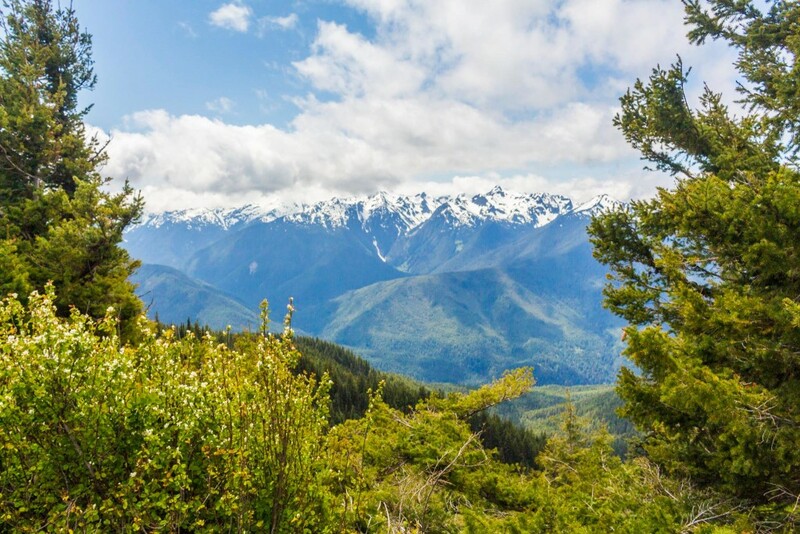 We wanted to visit the three major ecosystems, so we did Hurricane Ridge (mountain peak), the Marymere Falls walk (lush rainforest), and Rialto Beach (coastline). 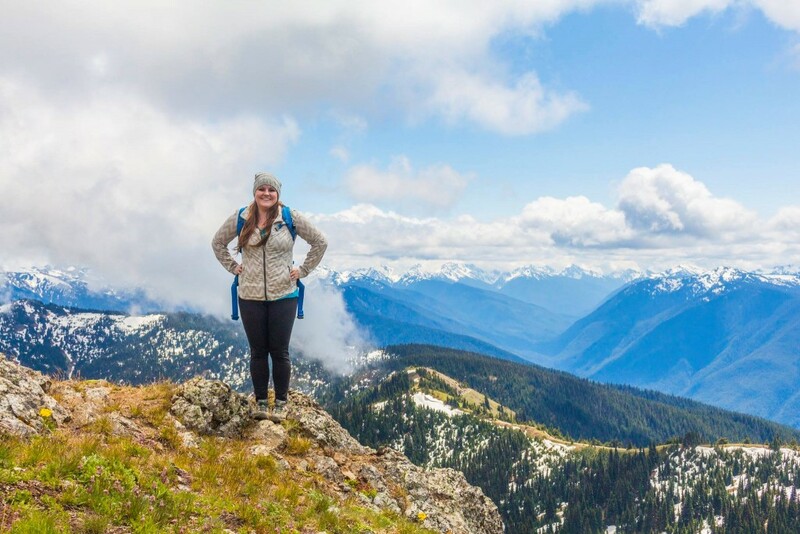 At the visitor center and online, I found that Hurricane Ridge was a must-see vista to visit. 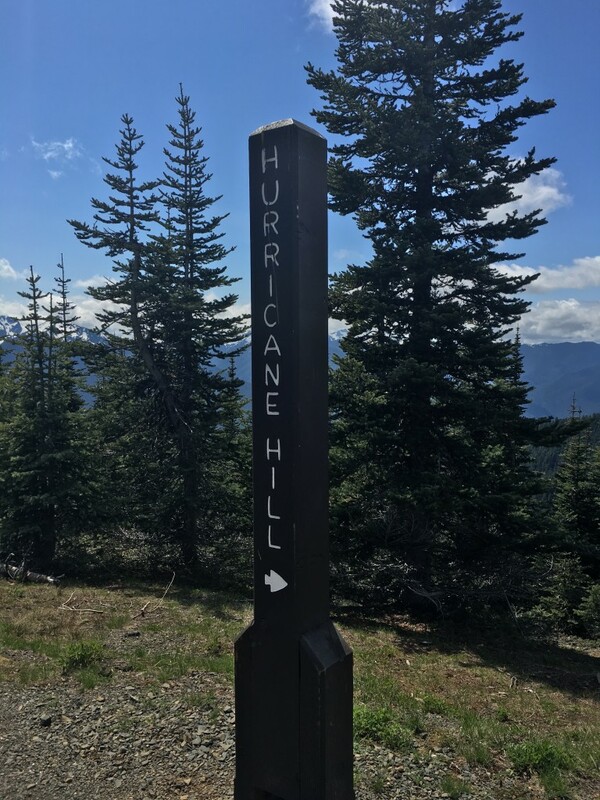 Named for its over 100-mph winds, Hurricane Ridge is accurately named. The park rangers also mentioned the Hurricane Hill Hike at the visitor center, and we made that our first priority to visit since the park was quite busy during the long holiday weekend. This was my favorite part of the park by far. I am a sucker for panorama mountain views. 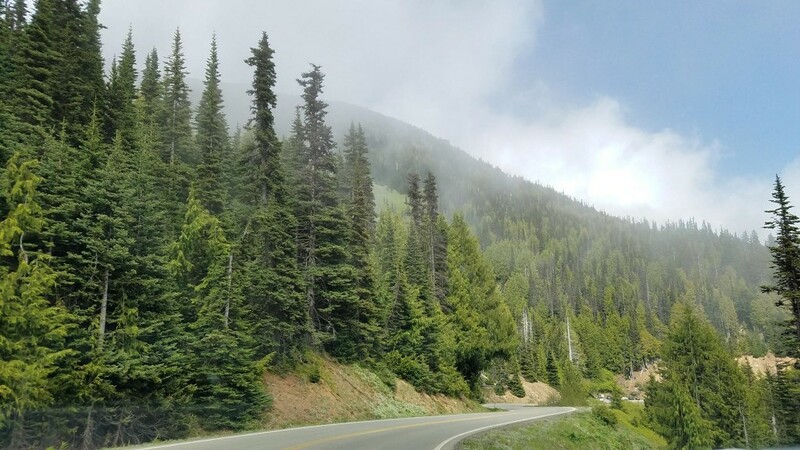 The drive up from the Port Angeles Visitor Center to the Hurricane Ridge Visitor Center is gorgeous. As you climb, you become part of the clouds. 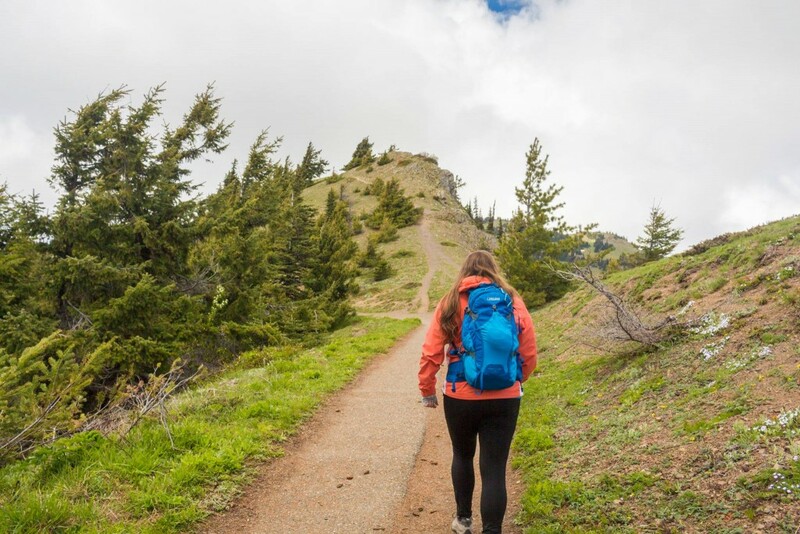 The trail itself is paved up to the top, and well worth the time. 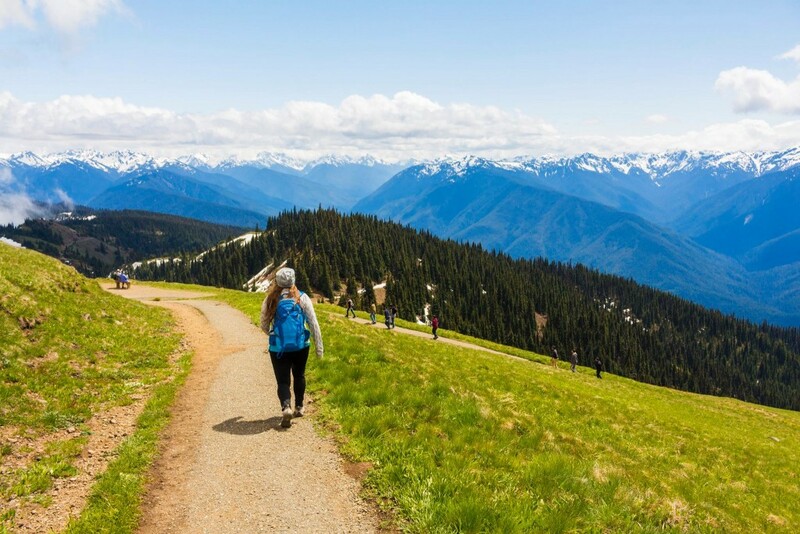 The hike starts past the Hurricane Ridge Visitor Center in a separate parking lot about a mile on a dead end road. The trail is clearly marked. You start with sub-alpine forest surrounding you, opening up into meadows. We were lucky enough to see some deer hanging around grazing. The trail starts out very easy and flat. 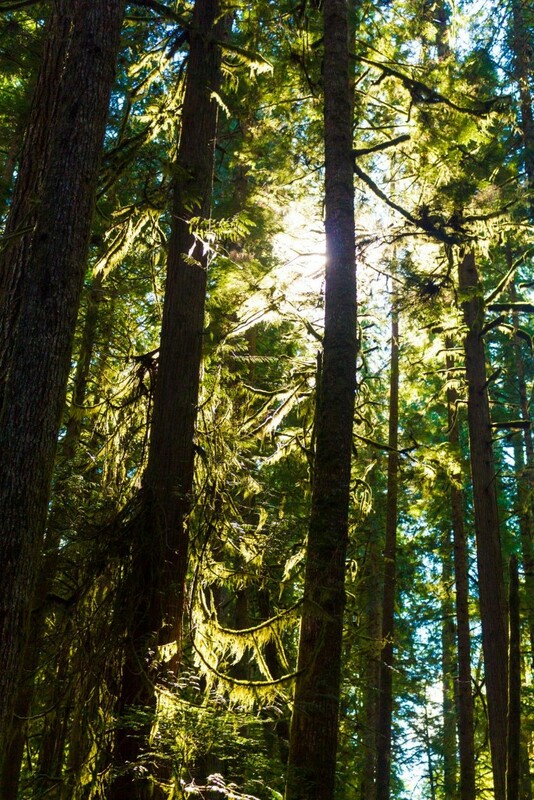 Right as you start, you are treated to views like this peaking through the trees. 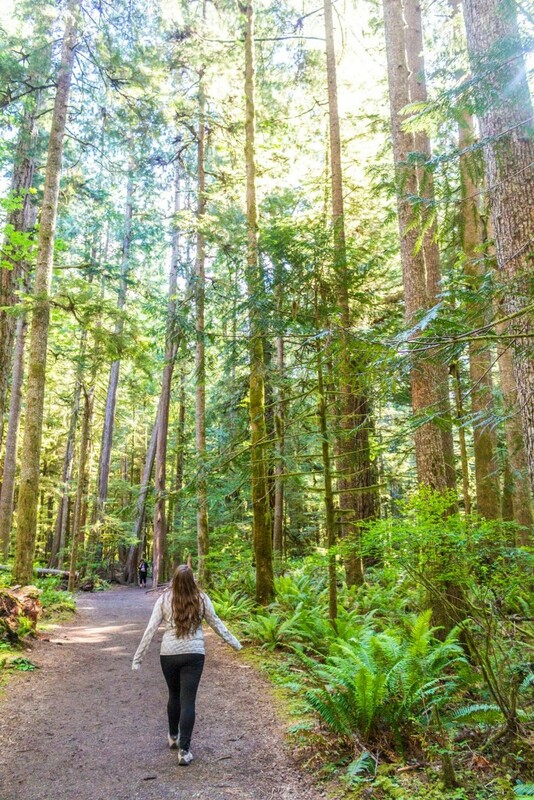 Make sure you take your time to enjoy the trail itself! About 3/4 of a mile in, the trail starts to climb up as you snake around the ridge. We were stopping for photos quite frequently because the views are stunning. Some wildflowers were beginning to pop up in the meadows. 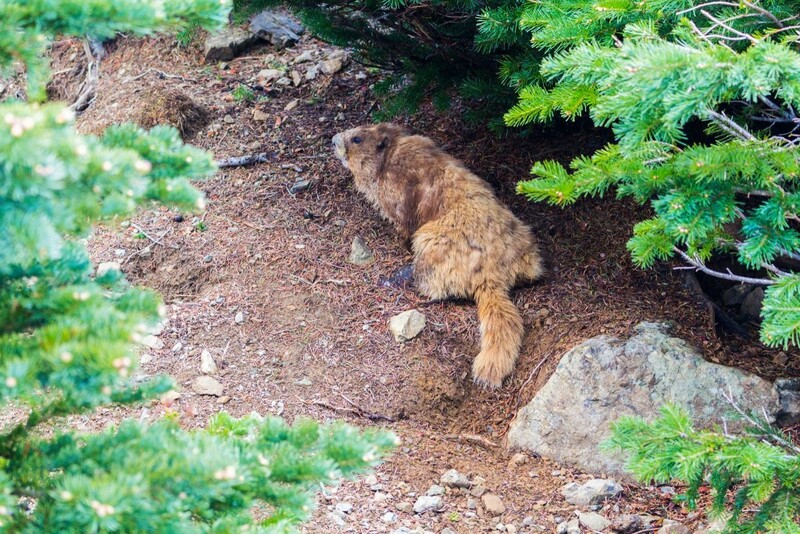 When we were almost to the top, we saw a marmot (classified as large squirrels) commonly found in mountainous areas such as this. It seemed to be unaffected by the large amount of people climbing up to see the top of Hurricane Ridge with us. The park ranger at the visitor center mentioned that there are mountain goats frequently as well, but we didn’t see any this visit. 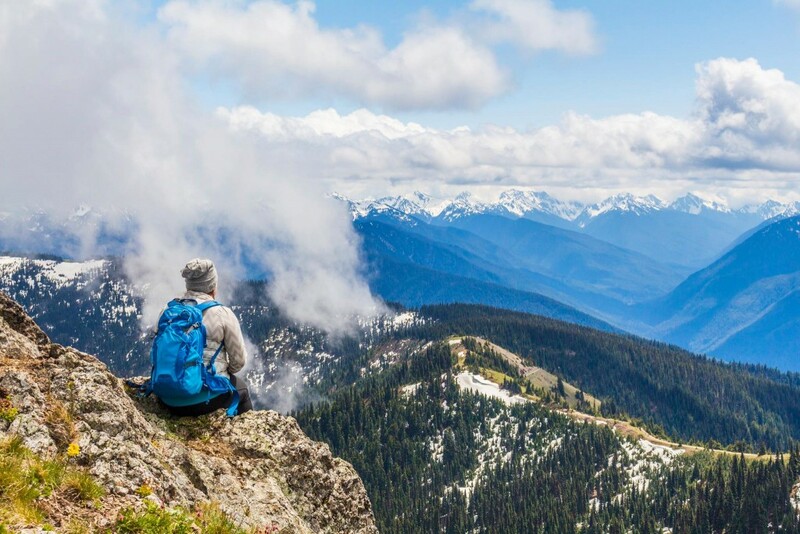 Once at the top, you are treated to views of the Olympic Mountains on one side of the ridge, and Victoria (Canada) to the other side. It was cloudy on the Canada side so we only got glimpses of the Strait of Juan de Fuca. The sun was in full force as we were on the way down from the top of the ridge. After our hike, we ventured out to one of the waterfall hikes that the park ranger recommended. I was skeptical that we could find a lush rain forest after where we had just been. 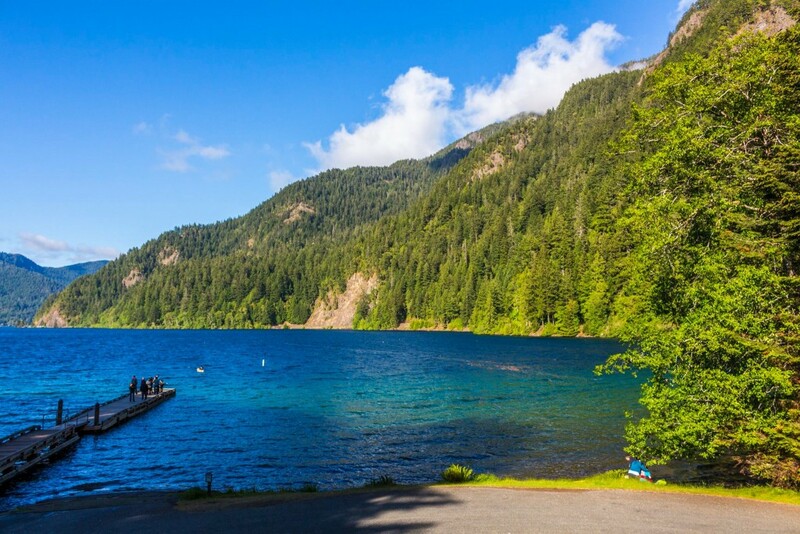 Within 30 minutes, we were in a mossy, lush old growth rain forest next to a deep blue lake. Amazing! 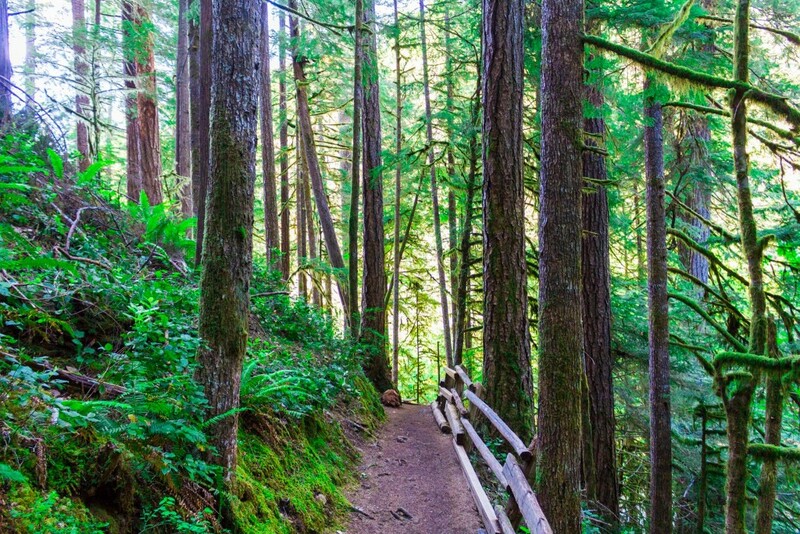 From the parking area, this trail takes you into a lush rain forest with trees that make you feel tiny in comparison. The trail was magical, especially with the light streaming through the trees making the environment glow. I felt like I was transported back to New Zealand to Hobbiton. So much green and moss! The trail itself was very flat with the exception of the short, moderate climb up to the falls themselves at the end of the out-and-back trail. Since the trail is very accessible and family-friendly, there were quite a few people taking this stroll with us. 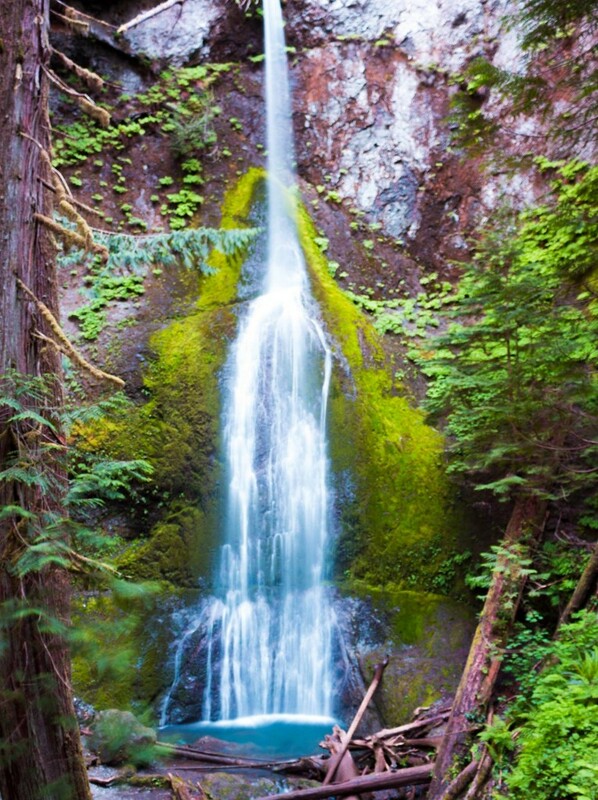 The falls were a picturesque mix of blue water and green moss surrounding the falls in the middle of this huge forest. What a different environment than Hurricane Ridge! Without remaining daylight, we drove out to Rialto Beach to see Hole-in-the-Wall. Unfortunately, our timing was not ideal as the tide was high and we were pretty exhausted from our exciting day. We were still able to experience the coastline. 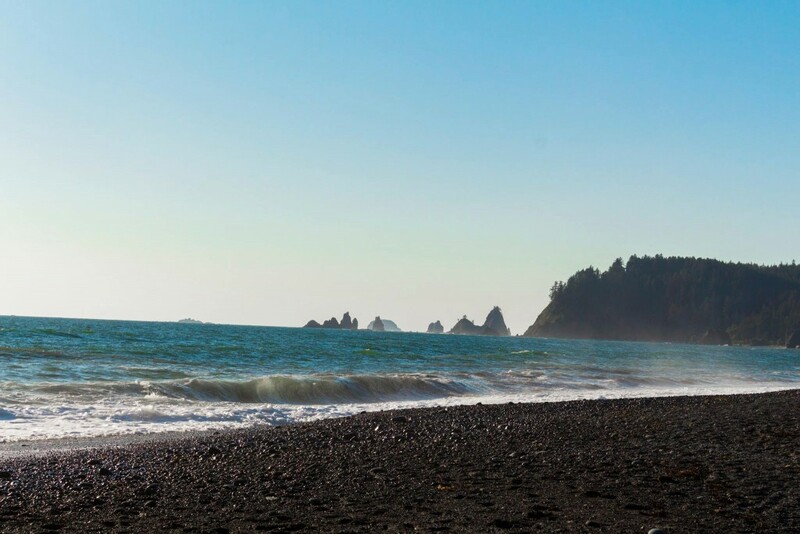 It was an interesting mix of forest with a rocky/black sand beach and sea stacks. It reminded me of Cannon Beach in Oregon. Next time, when we have more time, I’d love to do the hike to the Hole in the Wall and look at some of the tide pool action that this beach is known for. I loved that it was such a stark contrast to the beaches that I know at home in Florida. This beach is so rugged and natural. 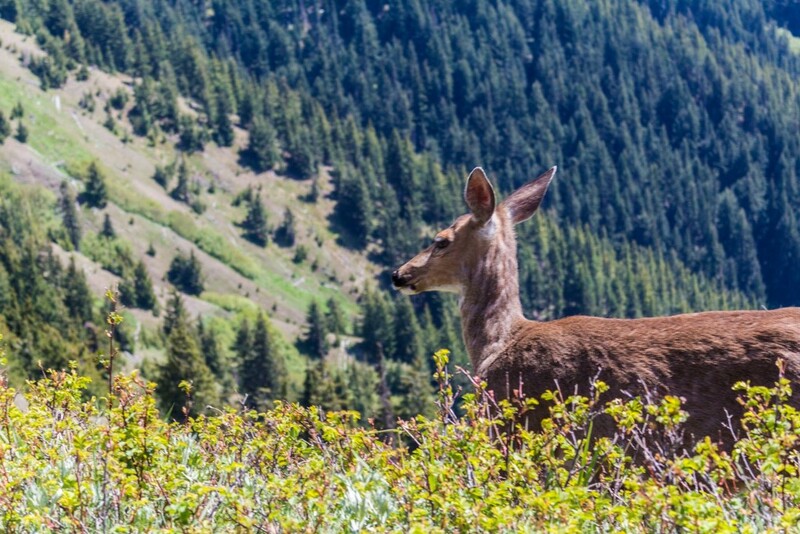 What do you look for in your national park visits? 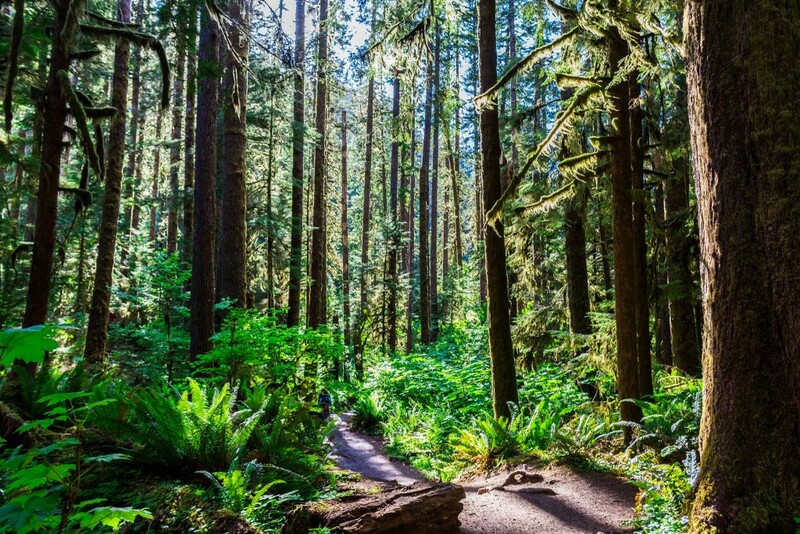 Do you enjoy mountains, beach, or forest? Thank you so much for this guide! I leave for Seattle tomorrow morning and plan on renting a car for a day or 2 just to see the Park. I’ve asked people where to go for and they couldn’t give me an exact answer (and it’s a pretty bring park so I want somewhat of a plan)! That first shot of you overlooking the mountain is breathtaking and I want one just like it! I’m so happy to hear this! Its an awesome, beautiful park with so much to see. It’s hard to fit it all in, but it’s gorgeous. I plan on returning soon. 🙂 I hope you had a great visit. Love hearing about your trip – thank you for the tips! What time of year did you visit? I went for Memorial Day Weekend last year! It was a perfect temperature, but tends to be the rainier shoulder season! Excellent post. Thanks for the good info! What backpack are you using in some the pictures? Did you have a tour guide with you? How easy is it to get around the park ? Where did you stay at night? We did not have a tour guide, but we did utilize the Visitor Centers! It’s easy to get around the park as long as you have a car. We set our Google Maps before we lost service, and retraced our way back until we got back into service. We also frequently use the map that the NPS service provides when you enter. We stayed in Bellevue, just outside of Seattle. It was a day trip!